The solar panels have been damaged. A deer or cow stepped on them and cracked them. The beacon is currently out of commission until I can replace the panels. Today I drove to Lincoln to check on the beacon. It hadn't been transmitting in a little while. The beacon bucket had been knocked over, and the radio had come unplugged from the batteries. Also the solar panels were not at the correct angle. Looks like a cow knocked my beacon around. I set everything back up and installed a new set of batteries. The new batteries are a battery pack from an APC UPS. This includes 32 5.0ah SLA batteries. All batteries are wired in parallel for a total of 160AH of reserve power at 12 volts. This battery box weighs 180 lbs. I installed a battery saver, so that if the voltage drops below 11.2 Volts It will turn the beacon off, and prevent the batteries from being discharged past the point of no return. I just got the antenna raised up a little more. The antenna should be about 17 feet above ground level now. The beacon has been moved to its new remote location. I moved it about 13 miles north to Lincoln, CA. It is about 500 ft elevation. New Grid is CM98jw. The beacon is still running on pure solar power. The antenna is currently 10 ft above the ground. My new beacon project is a Midland 13-883B 23 Channel AM CB made in 1976. This beacon will be my first attempt at making a fully solar powered beacon. 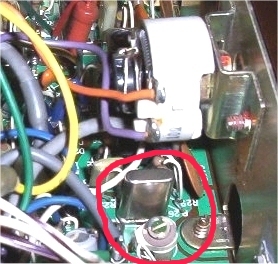 Output power is 4 watts. I'm running three 15 watt panels for a total of 45 watts of solar. The battery system is seven individual 12 Volt 9AH scooter batteries. Antenna is an IMAX 2000, which is 5/8 or .64 wave on 10 meters at 15 feet above ground level. Here are the states where my beacon has been heard so far. 5 Watt 12v bulb burn test. It ran for almost a week without draining the batteries. 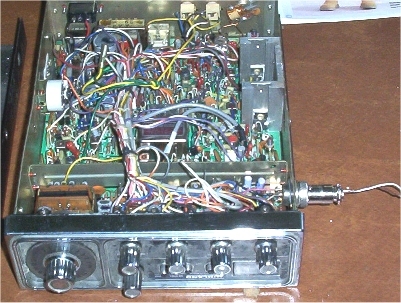 An old 1976 Midland 13-862C 23 channel CB. 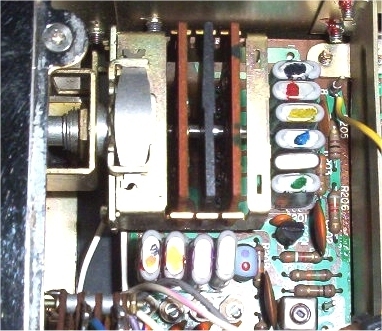 I replaced the 11.275 MHz transmit crystal with a 10.240 MHz crystal removed from a newer 40 channel CB. After adjusting the pots I was able to get the radio to transmit 1 watt solid peaking at 1.5 watts. The keyer is a homebrew microcontroller based keyer. It is a little overkill, but it works great for this application. The chip is an ATMEL ATMega8. 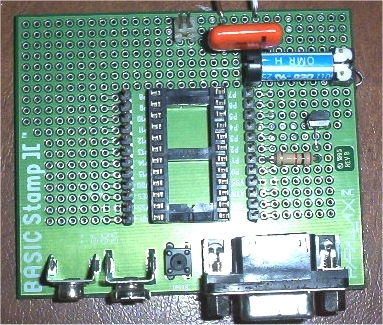 It is has an 8Mhz processor, 1Kbytes of SRAM, 512 bytes of EEPROM, and 8Kbytes of in-system programmable flash memory. I programmed it from the ground up using pure ASSEMBLY language. 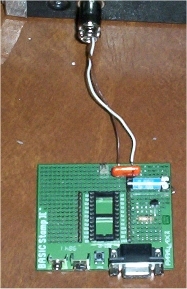 This keyer needs little external parts, and is very low current. See schematic below. http://www.atmel.com ATMEL the manufacturer of this chip. I ran this beacon for 6 months straight in 2004 and received confirmation that my beacon was heard in the following states (green). 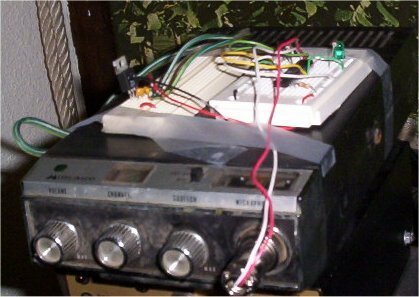 The radio is a Midland 13-892 23 Channel AM/SSB CB radio, that I converted to 10 Meters. The keyer interface is a Serial Port based relay that keys the rig on and off. The software that I am using to key to the serial port is CwType provided by UA9OSV, you can download it at http://www.dxsoft.com . This beacon was never put on the air because it was too chirpy. The rig, sitting on the table. Pictures of the crystals in this rig. 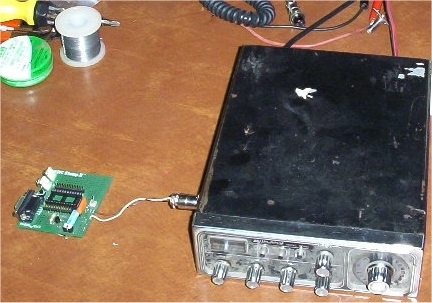 10.240Mhz that you can find in any newer PLL CB radio.